• 19 Oct 2004 – TOAST had on 10 August 2004 submitted a proposal to set-up an SNTC-TOAST Equestrian Training Centre at the Club’s site in Kranji. This Centre will also provide riding facilities for TOAST members and their families at an affordable cost. The said proposal was rejected by SNTC (in a letter dated 5 October 2004) on the grounds that the Club needed the facilities requested by TOAST “for the conduct of horse racing in Singapore”. However, SNTC has agreed to review TOAST’s proposal again. • 19 Oct 2004 – During the 4th dialogue session with SNTC, the subject of quarantine charges was brought to the attention of the Club’s management. It seems that owners were being doubly charged for AVA fees, 14 days Syce services and feed during the quarantine period. According to the fax received from IRT by our President Constance Cheng, which is similar, to the Circular No: T16/2004 distributed by SNTC to owners dated 12 March 2004 under “Terms and Conditions for Use of Singapore Equine Quarantine Station” clause 12, it clearly states the items charged should include the above. After the discussion, SNTC promised to investigate into this matter. • 1 Oct 2004 – We are pleased to announce that TOAST Racing Trust No.1 has been successfully formed. This Racing Trust has two well-bred horses and is now open for application from TOAST members as well as other prospective owners. The Racing Trust was formed to promote racehorse ownership at affordable costs. Promotion will follow up soon. • 15 Aug 2004 – TOAST held a get together at the Singapore Turf Club’s Casuarina Room for members and prospective owners to meet the Committee as well as Turf Club Officials and horse trainers. More than 60 members and guests attended, including SNTC President Yu Pang Fey, Vice-President Lau Kian Heng, Marketing Manager Simon Leong, Racing & Trust Manager Larry Foley, Trainer Dr. Yeoh K Chye and Trainer Michael Clements. • 13 Jul 2004 – TOAST fought for building of either a special overhead walkway or an underground tunnel leading to the Club’s entrance for owners. Due to the expensive construction cost (about 1.5 to 2 million dollars) for such a structure, it was not possible for SNTC to provide this facility. However, SNTC has now agreed to allocate 30 VIP car park lots, out of 90 that are available, for racehorse owners who own 5 or more horses to park at the VIP car park instead of restricting to those owners with 15 horses and above. • 21 Mar 2004 – Several TOAST Officials were invited to Annual Racing Awards Dinner hosted by Singapore Turf Club (SNTC) and Association of Racehorse Trainers (ART) held at Mandarin Hotel. The Chairman of SNTC recognized the formation TOAST in his speech that night. Among those representing TOAST at the function were President Constance Cheng, Vice-President Bernard Lee, Honorary Secretary Low Hong Tong, Treasurer Rosemary Yap, and Committee Member (co-opted) Dr. Omie Rangabashyam. It was an auspicious start for TOAST as two of its members won grand prizes in the lucky draw. TOAST Vice-President Bernard Lee won two return air tickets to Brisbane for the third prize. Member Mave Yeo won two return tickets to Auckland for the first prize. looking at their winning prize. • 3 Mar 2004 – TOAST had our first dialogue with Singapore Turf Club. The dialogues will enable SNTC and TOAST to get to know each other better and therefore, is a good development for ingapore Racing. SNTC is happy to discuss issues with TOAST and Association of Racehorse Trainers, Singapore (ART) and take criticism, an approach, which is good for racing. Several matters were brought up during the meeting including allowing galloping on grass track for young or recovering horses, spelling station and upgrading of car park facilities for owners. • Jan 2004 – Fantastic Diamond, a 7 year old Australian thoroughbred gelding and ex-racehorse from Singapore Turf Club, is now having a new successful career as a dressage horse at the Bukit Timah Saddle Club (BTSC). Since March 2001, BTSC rider Louise Ostergaard has been re-schooling him to become a dressage horse, basically taking him all the way back to basics and building the muscle groups used in dressage. Despite the high level of the imported European Warm Blood horses in local and regional competitions, Fantastic Diamond has successfully won numerous competions in different classes - both nationally and Internationally, and was in 2003 the number one horse on the official World FEI/PSI ranking list for South East Asia. 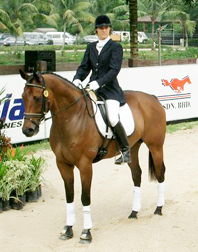 Some of his major wins are: Malaysia Open 2003, Merdeka Masters 2003, FEI/PSI World Dressage Championships, Singapore.